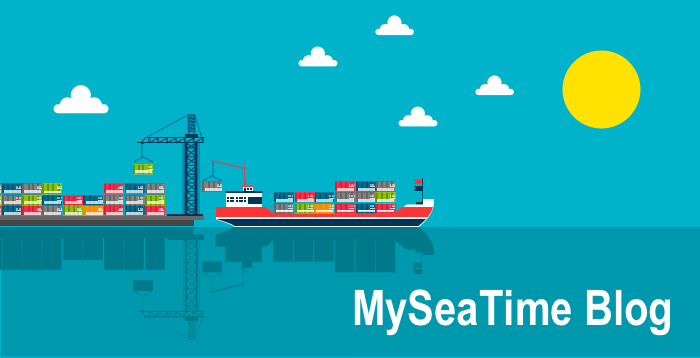 How an IMO convention enters into force and how it is amended ? 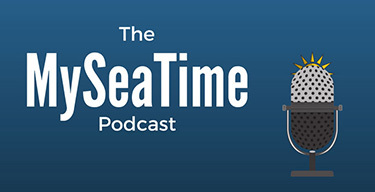 One thing that no seafarers can avoid is to not to deal with IMO conventions. IMO conventions run the shipping trade. Now try saying that ten times. I say this even when I am of the opinion that few of the IMO conventions are poorly implemented in the industry. But for we seafarers who are not maritime lawyers, the process of IMO conventions confuse us. 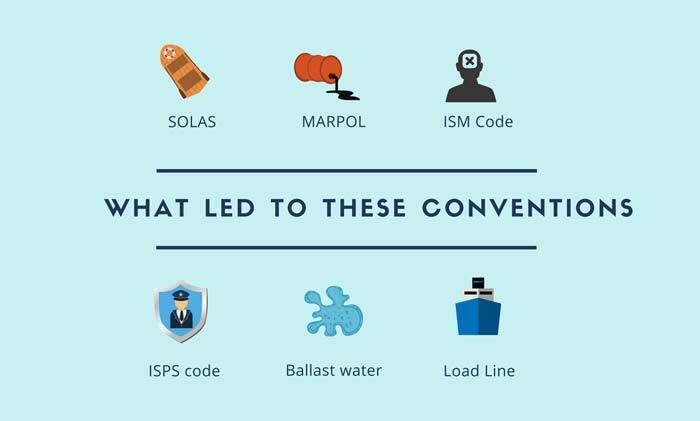 After all, there are so many terms associated with the IMO conventions. Protocol, code, resolution, treaty, convention, circulars, amendments and much more. Well, I am not writing this post to define all these terms. I have already written on a couple of these terms in my earlier posts. Few of these posts are here for quick reference. Treaty and Convention, How These Two Are Different? What is the difference between a Convention and a protocol? 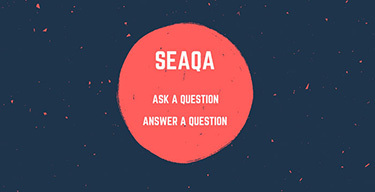 What the difference between a treaty and a convention? But what I am here to discuss today is the process birth of an IMO convention and how and when it is amended. 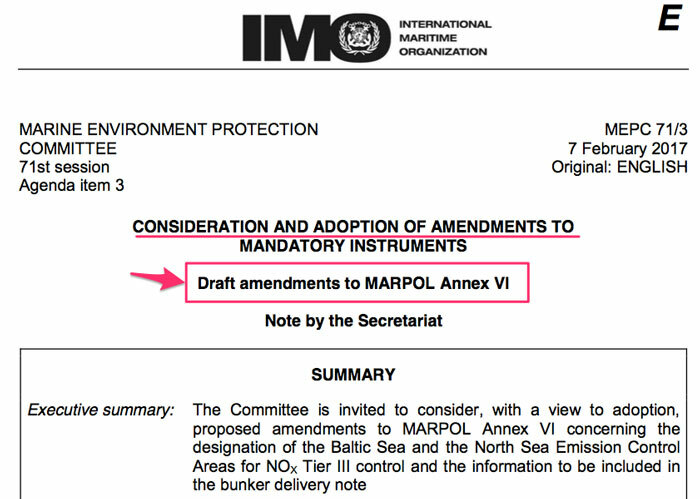 Before we discuss anything about IMO conventions, we need to know who decides if a new IMO convention is required? Let us think of few of the IMO conventions. What triggered the need for these conventions? SOLAS: The sinking of Titanic and loss of more than1500 people triggered the need of a convention that could look into the safety issues. That led to the formation of SOLAS convention. MARPOL: Grounding and oil pollution from oil tanker Torrey Canyon alerted the world to the dangers of oil tankers. This incident and many other oil pollution incidents in mid 60’s led to MARPOL convention. ISM: The sinking of Herald of free enterprise highlighted the issue of “Human error” and IMO responded with the introduction of ISM code. 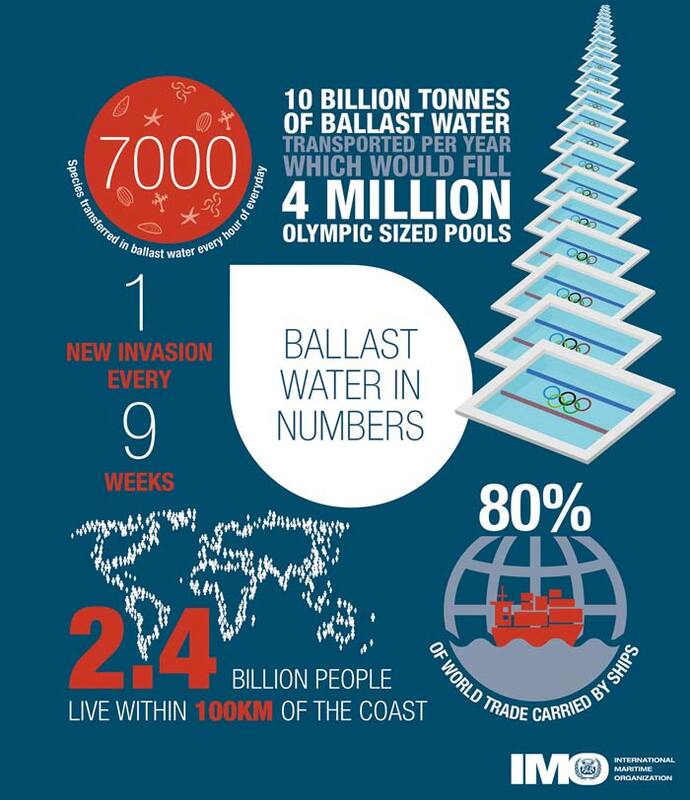 Ballast water convention: Various studies found that when ballast water is a dangerous source of the relocation of many organisms in water. If suitable conditions exist in this release environment, these species will survive and reproduce and become invasive species. In many cases, these organisms can become a dominant species by the extinction of native species. That can have negative effects on public health and industries that rely on this water. We can see from these conventions that whenever a weak link is identified in the shipping trade, IMO brings a convention to address that. Even the enhanced survey programme was introduced as a result series of loss of the bulk carriers because of structural failures. Bottom line is that whenever IMO finds any weak link, it responds with either bringing a new convention or amendments to the existing convention. 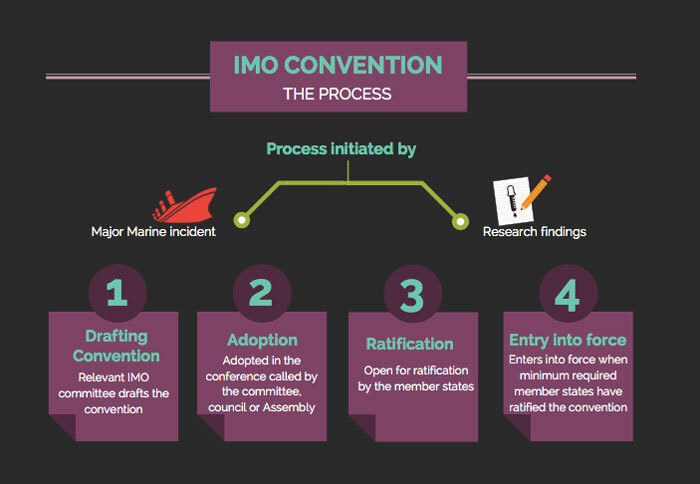 How a new IMO convention enters into force? When the IMO identifies a need for a new convention, it starts the process of bringing it into force. But bringing a new convention into force is not so easy. 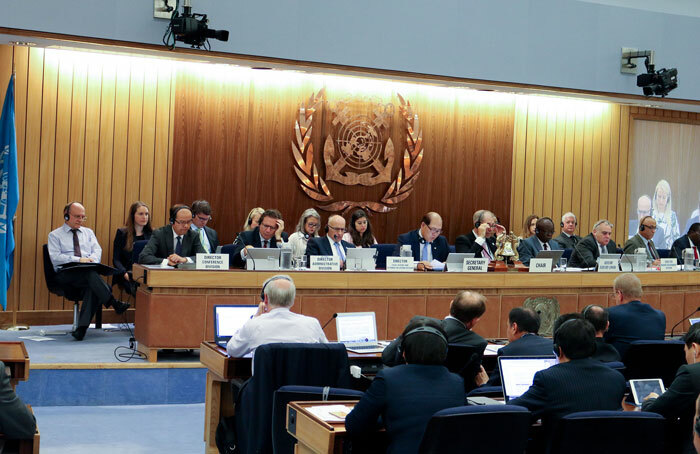 The mere fact that the ballast water convention entered into force after 13 years of its adoption would suggest how hard it may be for the IMO to bring a new convention into force. Entry into force of an IMO convention is a lengthy process. And it starts with a suggestion from one of the members in the session of the committee. This is followed by a process to create a draft convention. The session of the committee is held every 6 months. Based on the information and research, any member state can propose the need for a new convention. If satisfied with the merits of the proposal, the committee will forward the proposal to council or assembly as required. If the Council or Assembly accepts the proposal, it would authorize the committee to proceed with the work. The committee will then work on this proposal in detail and will draw a draft convention. This draft convention is then sent to the Council and the Assembly. At this point, the committee would also recommend the Council and Assembly for a conference for the adoption of the convention. The Council or the Assembly would set a date for the conference for the adoption of the convention and communicate this date to all the member states. The draft convention is also circulated to all the member states for their comments. The committee examines the comments (if any) from the various member states to amend the draft convention before the conference. In the conference, the amended draft convention is presented to the member states. Once the majority of the member states present agree with the final draft of the convention, it is formally considered adopted. The adopted convention is then sent to the Secretary General of the IMO who sends the copies to all the member states. An adopted convention is still not binding on the member states. The convention needs to be ratified. The required conditions for this adopted convention to be considered ratified are pre-agreed during the drafting process. These conditions are in one of the articles of the adopted convention. The convention will enter into force 12 months after ratification by a minimum of 30 States, representing 35 percent of world merchant shipping tonnage. How many states and how much tonnage percentage for ratification is decided by the committee and agreed by the member states during the adoption process. Generally, the stricter convention would require more number of states and tonnage to ratify the convention for its entry into force. A convention would enter into force when a minimum number of member states accepts it. But how do a member state can tell the IMO that they accept an adopted convention? If the convention allows, the most formal way of showing the acceptance of the convention is by a simple signature. In this method, the representative of the member state signs on the sheet provided by the IMO. This would mean that the state wants to sign the convention but it must first be accepted or approved by the parliament of their own state. IMO allows a certain period to the member state for showing their acceptance to the convention by signature. 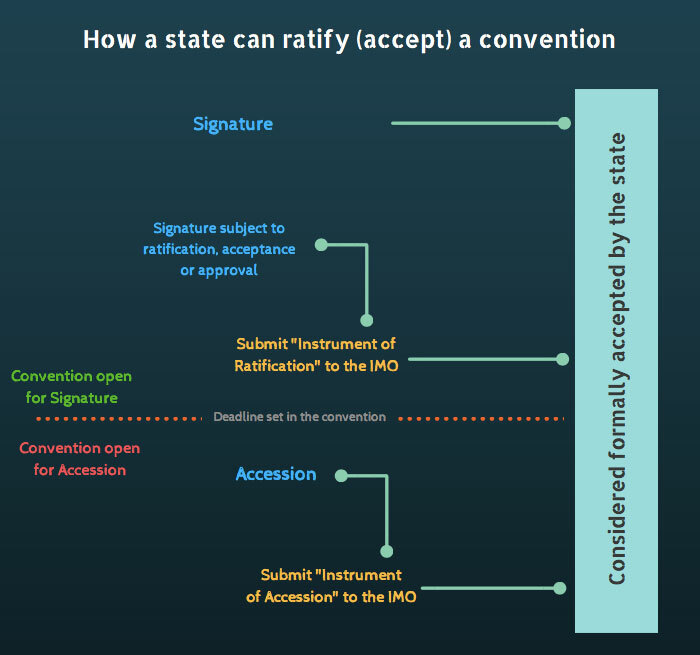 If a member state has signed the convention subject to ratification, acceptance or approval, this member state would not be considered to have shown its consent for the convention. This means that IMO would still not consider this state as the one which has ratified the convention. This member state is required to deposit a document called “instrument of ratification” to the depository of the convention. In simple terms, the depository is the department which keeps the track of member states that have ratified the convention. 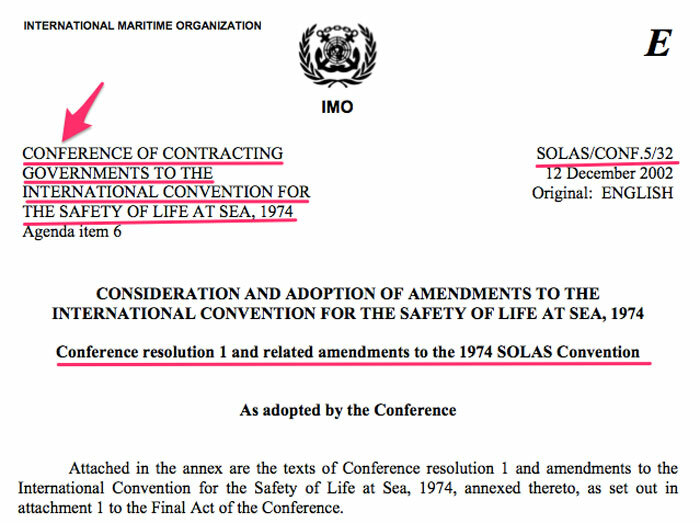 IMO sets a time frame (say, 12 months after adoption) for the acceptance of the convention by signature. After this time frame is over, the member states can show their consent by accession. Accession is the method used by a State to become a party to a treaty which it did not sign whilst the treaty was open for signature. A member state is considered to have become the party to the convention when it deposits the “instrument of accession” to the depository of the convention. For example, Ballast water convention was to enter into force 12 months after ratification by a minimum of 30 States, representing 35 percent of world merchant shipping tonnage. As of Jan 2016, the convention was ratified by more than 30 states but it still was short of 35% of world shipping tonnage. 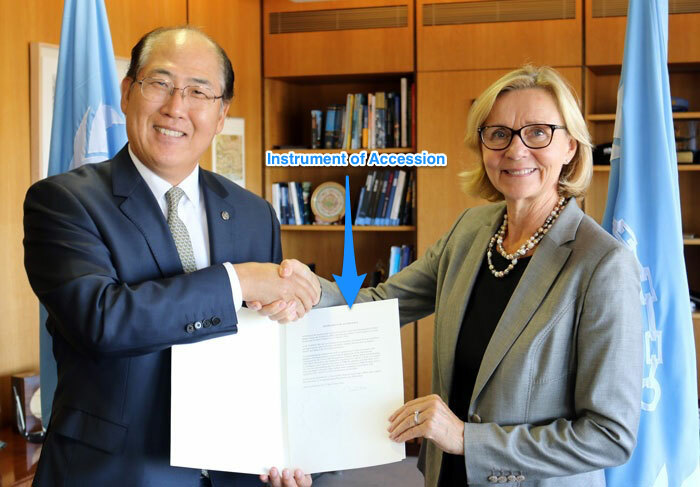 In September 2016, when Finland submitted the “Instrument of accession” to the IMO the conditions required for the ratification of Ballast water convention were met. Following the accession by Finland, the ballast water convention entered into force on 04th Sept 2017. After the convention has been ratified by the required number of states with the required total tonnage, it would enter into force after a pre-defined time. 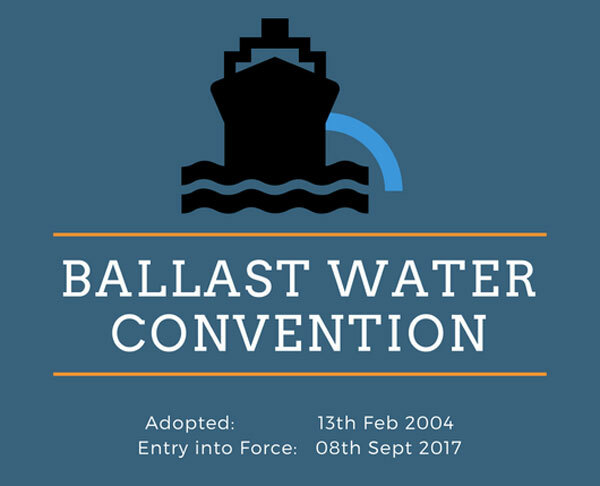 For ballast water convention, this time was set at 12 months after ratifications of the convention. This time is used to prepare for the implementation of the convention. The member states which have ratified the convention need to include the convention in their country’s law. This means that the state needs to amend their “merchant shipping act” (if that is what this law is called in that country). When the convention finally enters into force, the countries that have ratified the convention would have the provisions of the convention included in the country’s local laws. This way the convention becomes legally binding on the ships that fly the flag of the contracting states to the convention. 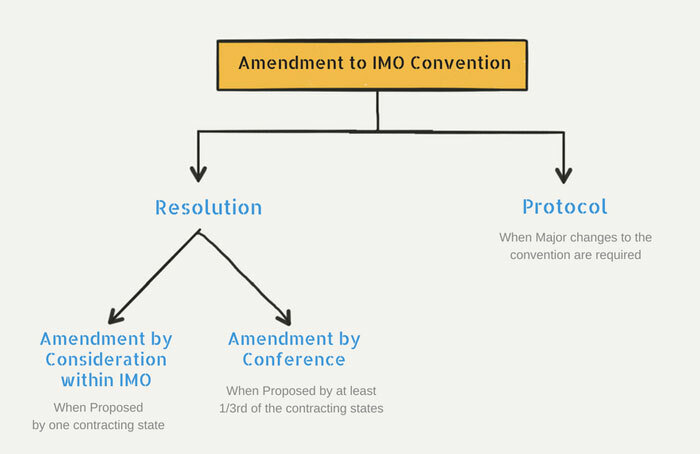 How is an IMO convention amended? A convention that is relevant today may require some changes for it to be relevant after few years. IMO not only works to bring new conventions but also continuously works on improving the existing conventions. This may require the existing conventions to be amended. Broadly there are two ways a convention can be amended. There are two ways to initiate the process of amendment by passing a resolution. 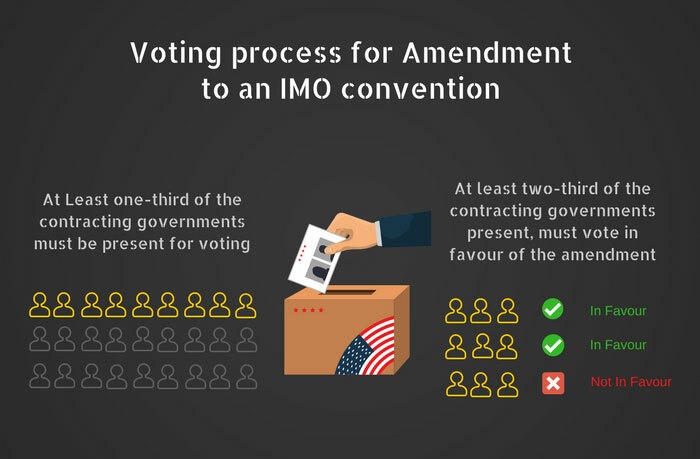 Let us look at the stages of process of amendments of a convention by consideration within the IMO. The SG would pass the amendment proposal to MSC or MEPC for review. MSC or MEPC would draft the resolution and submit the resolution for adoption. Once MSC or MEPC have the draft of the resolution, these are forwarded for adoption. Resolutions are adopted by voting in Maritime safety committee or Maritime Environment Protection Committee. At least one-third of the contracting governments should be present for voting. At least two-third of the contracting governments present should vote in favor of the resolution. The adoption process requires the presence of only one-third (at least) of the contracting states. But for acceptance of the resolution, the majority of the states need to agree on the resolution. The most common way of acceptance of a resolution is “tacit acceptance”. As per the “tacit acceptance”, it is implied (assumed) that a contracting state has accepted the resolution if it does not oppose it within a particular time frame after the adoption. The conditions of the acceptance of a resolution are provided in one of the articles of the original convention itself. In this way, a group of at least one-third of the contracting governments need to propose the amendment to the relevant committee of the IMO. The committee would then call for a conference of all the contracting states for that convention for the adoption of the proposed amendment. The process of adoption and acceptance is similar to what we discussed earlier under “amendment by consideration within the IMO”. This is the fastest way to bring an amendment to a convention. Check out the two conditions for the adoption of an amendment. 1. At least one-third of the contracting states must be present for voting. As one-third of the contracting states have proposed the amendment, they all would most certainly be present for voting. Even if all the contracting states were present for voting, the one-third are already sure of voting in favor of the amendment. The protocol is not exactly an amendment. It is a convention within a convention. Sometimes a change is required in the convention that is too significant to be amended by a resolution. a change that is applicable to the all the chapters of the convention. the entire convention needs to be reworked. Protocol to the convention brings major changes to the convention. The states that had ratified the original convention may not accept the protocol to the convention. For this reason, the protocol to a convention enters into force in the same way as a convention would have. This means that a particular number of states with the certain percentage of world’s tonnage need to ratify the protocol for it to “enter in force”. Even when a protocol enters into force, it will only be binding to the countries that have ratified the protocol. It will not be binding on all the contracting states to the original convention. As you can see that out of 163 countries that ratified the SOLAS convention, 43 countries still have not ratified the 1978 protocol to the SOLAS convention. And 53 countries that ratified the SOLAS convention have till date have not ratified the 1988 protocol to the SOLAS convention. Among many other things, IMO’s work include creating new and amending existing conventions to help ships face the challenges at the sea. As seafarers, to understand the signficance of these conventions we must understand how these conventions are brought and how these conventions are amended. Good read Capt! Been reading your blogs recently and learning a lot, keep it up sir & thank you for sharing! Sir good day . My self Gautam Kumar . I am NCV master. I had passed my ORAL yesterday only. I just can not stop my self writing to you . Sir I was much confused before studying blogs of yours on IMO 's process of getting Resolution adopted and there are various other things (Especially P & I club , Marpol Annex IV , etc) , Sir I had studies on other sites also but your blogs have more clarity and best part is your examples (case study ). However the read content were not been asked in my orals part but they all were very informative . Thank you very much for making available such a good platform. Appreciated if some blogs related NCV (Indian Coast Trading , Manning of NCV Vessel , Coastal Navigation etc) also followed in your next blogs. Well, this is so useful, I am preparing for MEO Class I.... the concept was given in so many books but beautifully explained here in your blog. Very good, easy to read explanation on some of the workings of the IMO. Well done! This gave a clear picture, thank you captain! 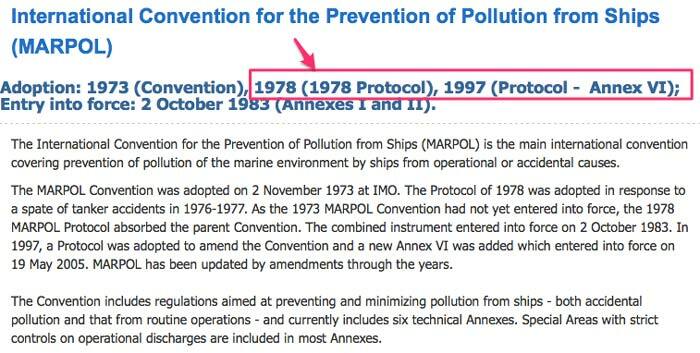 Could you shed some light on the countries not ratifieng a protocol, if I understand correctly it means that MARPOL annex 1&2 are mandatory, the others are not since they didn't exist in the original convention?